Staten Island, NY (December 10, 2018) – Late on Sunday night, December 9, a motor vehicle collision between a vehicle and a firetruck took place on the Staten Island Expressway, according to authorities. The accident which resulted in seven injured people was reported to have occurred as the firetruck was heading to a call at around 10:00 p.m. Authorities stated that the firetruck involved had been stopped on the roadway in response to a car hitting a deer when the truck was rear-ended by another vehicle. According to emergency responders, two people from the car involved were immediately taken to a local hospital as five firefighters were evaluated at the scene. All resulting injuries are currently believed to be relatively minor at this time, however, this is a currently a developing story. No further details have been released as the NYPD was unable to provide any information. First and foremost, we would like to offer our sympathies to all of the injured victims of this accident as we warmly wish for their full recoveries. 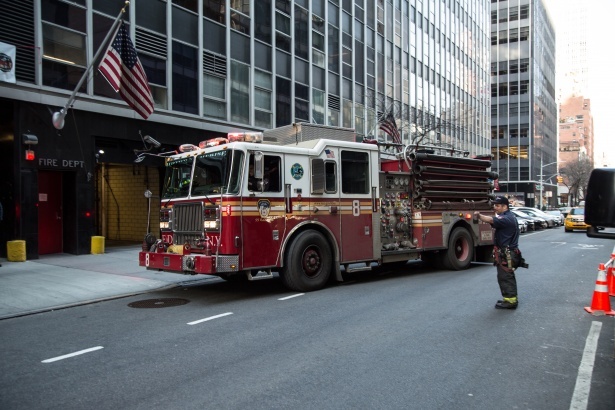 New York car accidents frequently take place for many different reasons, often related to the inattentive operation of one of the vehicles involved. At this time, it is essential to know that you may have substantial rights in the event that your injuries were caused by someone else’s reckless behavior. At Hach & Rose, our New York accident attorneys are dedicated to assisting those who have been hurt by the irresponsible actions of another person or entity. If you have been injured in a New York car accident, please do not hesitate to call 212-779-0057 and let us put our extensive experience to work for you today.